The concert grew under the patronage of Paraguay’s First Lady, Mar­a Gloria Penayo de Duarte, who was named as the UN’s Food and Agriculture Organization (FAO) Ambassador Extraordinary in recognition of her commitment to helping the most vulnerable communities in her country. Beginning at 20:00 hrs local time, the concert will be relayed live on Paraguay’s national TV and will be shown on giant screens set up in different parts of the country. In conjunction with INTELSAT, the concert will also be broadcast worldwide via satellite and can be used freely by television networks. The show will feature singing performances by Ronan Keating (Ireland), Noa (Israel), Al Bano Carrisi (Italy), Paul Young (UK), and Axel (Argentina) — among many others. They will all be accompanied by a symphony orchestra and chorus under the Italian conductor Renato Serio. 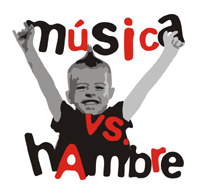 Music vs. Hunger is part of the TeleFood campaign organized by FAO in 1997 to initiate concerts, sporting events and other activities with the participation of celebrities and NGOs to muster the solidarity of the general public in the fight against hunger. Now in its 10th year, TeleFood has helped finance more than 2,000 projects in 127 different countries. The focus is on sustainable projects aimed at helping small-scale farmers in developing countries to produce more food for their families and communities. In addition to ticket revenues, the organizers hope to raise money from the sale of souvenirs, and also from donations paid into special bank accounts set up for the event. “The energy of young people is crucially important in sending out signs of hope to the world, and music can be a way of spreading understanding that hunger suffered by our neighbours is everybody’s problem,” says musician Ronan Keating in a recorded message for broadcast by Paraguay’s largest television networks. Gilberto Gil says that it is “unacceptable” that worldwide 35 000 people starve to death each day and adds that “eradicating hunger is not a dream” but rather an achievable goal whose success depends on the will and determination of all of us.